It's here, it's here! It's finally here! The award winning advergame from last year's Doritos Unlock Xbox challenge is finally making its way to the Xbox Live Arcade this weekend. Doritos Dash of Destruction, created by Mike Borland of Pennsylvania, is a melding of his love of racing games and his irresistible hunger for cheese-flavored corn chips. 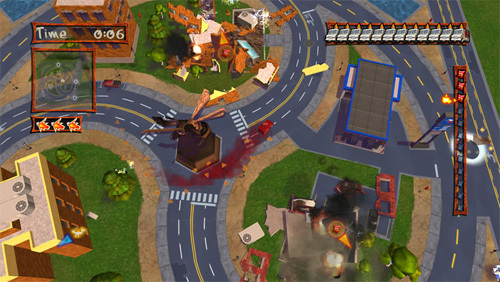 Players take turns playing as either a snack chip crazed tyrannosaurus rex or a Doritos delivery truck driver desperately trying to survive in a world gone mad. The game has been rebuilt from Borland's original concept by the fine, patient, and hopefully well-paid folks at NinjaBee, who developed Band of Bugs, Outpost Kaloki X, and other games worth actually paying for. Look for Doritos Dash of Destruction on Xbox Live Arcade this Wednesday. Or don't. At least it's free?